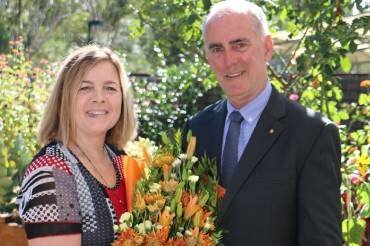 Tireless community worker and volunteer Vivienne Bruce has been named as the Lake Macquarie Woman of the Year. Lake Macquarie MP Greg Piper made the announcement on Thursday and paid tribute to Ms Bruce's dedication to the community, and in particular those less fortunate. Here's how David Stewart at the Lakes Mail reported the event. Below that is a brief tribute Mr Piper made in State Parliament. MANAGER of Southlakes Carers, Vivienne Bruce, has received the state government’s award for Lake Macquarie Woman of the Year. Member for Lake Macquarie, Greg Piper, presented the award to Ms Bruce in a ceremony at the organisation’s Morisset headquarters on Thursday. Mr Piper paid tribute to Ms Bruce’s dedication to her community through various organisations. “I’ve known Vivienne for quite some time. It was 22 years ago when Horizons [Disability Service] first started, and Vivienne came in as a volunteer,” Mr Piper said. Ms Bruce progressed to a casual employee with Horizons before becoming coordinator of Southlakes Neighbourhood Centre. She later become manager of Southlakes Carers which supports local people with disabilities, the frail, aged, and their carers. Earlier, Ms Bruce ran education groups at the Neighbourhood Centre which often provided the first step to education for people from various challenging backgrounds, Mr Piper said. And as a volunteer of 20 years with the Salvation Army, Ms Bruce had facilitated ACE Kids Club, an after-school program; Project 31 for young women in their teens and early 20s; Women to Women, a group that empowers women; and the Reach support program for people facing life challenges including addictions. Ms Bruce said helping people get back on their feet, and onto a positive pathway, was rewarding. “But I’m not an island. It’s all about the team,” she said. Receiving the award was “overwhelming” and “humbling” she said. Among the highlights of her career occurred in 2006 when, with the help of the Salvation Army, she helped to organise delivery of a truckload of donated toys, food hampers, and other goodies for families in Wellington, which had been devastated by drought. Mr Piper said his office received more than 2000 words in submissions from locals supporting Ms Bruce’s nomination as Woman of the Year. He said it was indicative of the high regard in which Ms Bruce was held. Lake Macquarie is blessed with many wonderful community-minded people, and a fine example is Vivienne Bruce. I recently had the privilege of presenting Viv with the Lake Macquarie Woman of the Year Award, which recognised her many years of service to a range of community groups. Vivienne is currently the manager of Southlakes Carers, a group dedicated to providing community services to the aged. Having raised four children of their own, Viv and her husband, Steve, became the full-time carers of their four young grandchildren in 2015. Viv began her career as a volunteer with Horizons disability services before being employed by the group. She later coordinated neighbourhood centres and ran early education groups. She has worked as a volunteer for the Salvation Army for more than 20 years and has been the driving force behind after school care programs and programs for young women and people facing life's challenges. She is a youth mentor and spends a significant amount of her own time helping people who are generally not in a good place. Vivienne is a solid, reliable friend to many and I am pleased to be one of those and to have the opportunity to recognise her efforts in the Parliament.